She walked into a public square in Tehran last March, doused herself with gasoline and set herself aflame. The last words of Dr. Homa Darabi, Iranian university professor and activist against the Islamic regime, were, "Death to dictatorship! Long live freedom!" In 1979, a revolution in Iran succeeded in bringing down the monarchy of the Shah. Soon afterwards, the exiled Ayatollah Khomeini, who had led the revolution from afar, returned to establish the Islamic Republic of Iran. Inspired by hopes for democracy, economic prosperity for all classes, gender equality and a leadership that would not allow Iranian culture to be swallowed up by Western values, many Iranian women joined the 1978-'79 rebellion against the rule of the Shah. Women came together to protest such sexist attitudes as expressed by the Shah in 1973 when he said, "A woman is important in a man's life only if she is beautiful and charming. . . . You are equal to a man in the eyes of the law. But excuse me for saying so, you are certainly not equal [to a man] in your capabilities." But did the Iranian Revolution and the Islamic Republic come through for women? Did it give them the freedom, the equality and the dignity that it promised? Fourteen years after the revolution, perhaps the most revealing answer to this question was given by Darabi when she sacrificed herself. Zaria, a member of L'Association des femmes Iraniennes de Montreal, said the public suicide of Darabi "was to show all the injustices against a woman [in Iran]." Zaria said Darabi had repeatedly tried to leave the country to see her children, but was denied permission because her husband would not sign a consent form. "In Iran, women are not allowed to leave unless their husbands give them permission," explained Zaria, noting that if a woman does not have a husband, it is the father who gives permission. "It is always the man who is in power." Darabi's suicide speaks most loudly as a testimony for the conditions surrounding Iranian women because of the silence that surrounded her act. Neither the Iranian nor the international press took it seriously. Zaria claims her association tried to contact the Montreal press, "but nobody would listen." At the start of the rule of the Islamic Republic, women were a central part of revolutionary activities. 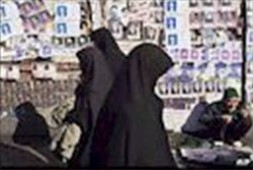 They used their influence to rally support for Khomeini through women's groups, charity work and propaganda in the Iranian women's journals, such as Zan-e-Rouz. The Ayatollah recognized the participation of these women and made efforts to "praise" them. He is quoted as saying, "In our revolutionary movement, women have. . .earned more credit than men, for it was the women who not only displayed courage themselves, but also had reared men of courage. . . . If nations were deprived of courageous women to rear true men, they would decline and collapse." Iranian women began to receive the rewards for their support of the Islamic Republic soon after 1981. The first of these was the compulsory hijab (Islamic modest dress) in the work place. This was followed by a law ordering the hijab in all public places, for all women, Muslim or not. Women had fought in the revolution so that their choices would be expanded. They had donned the veils at the demonstrations against the Shah to say that nobody could stop them from wearing the veil if they wanted. The Islamic regime reversed their statement and made it impossible for women to choose not to practice the hijab. The government justified its policy with statements such as the one made by the cleric, Muteza Mutahhari: "The disgraceful lack of the hijab in Iran before the revolution. . .is a product of the corrupt Western capitalist societies. It is one of the results of the worship of money and the pursuance of sexual fulfilment that is prevalent amongst western capitalists." But many women did not buy the rhetoric. They saw the enforcement of hijab as a means to suppress and denigrate the status of women. After their attempts at repealing the law failed, many women began to flee the country. The new policy concerning women continued to be implemented in a series of laws between 1981 and 1983. Segregation of the sexes stretched to public pools, buses and, finally, to educational institutions. Women's voices were banned from the radio and female singers and actresses were no longer seen on television. Women were systematically purged from any high-level government positions and were banned from participating in the judiciary. More and more, the public role of women was equated with corrupted morality and lack of chastity. An example of this policy in practice was the December 1979 execution of Farrokhru Parsa, the female minister of education. Parsa was accused of promoting prostitution, corrupting the earth, and "warring against God." Also, new education policies prevented women from enrolling in the fields of engineering, agriculture and finance -- as these were deemed to be male professions. However, women were still encouraged to enter the field of medicine. Daycare centres closed, and women were denied the right to divorce and obtain custody of their children if divorced. The age of consent for marriage was lowered from 15 to 13 years old. Contraception and abortion were also banned. Khomeini's government seemed intent on making a woman's life revolve around the rearing of "true men." At the same time as the new policies were being implemented, the constitution of the Islamic Republic enshrined women's right to vote, saying that both men and women were equal before the law. The stipulation was qualified, however, by adding that the equality only went so far as the Shar'ia (Islamic law) allowed. This meant that women were subject to many restrictions. One example, cited by Zaria, is the inability of women to divorce. Another is the lack of credibility given to a woman's testimony in a court of law. Zaria explained that, whereas a male witness' testimony to the crime of assassination is accepted, "it takes two female witnesses to give the same credibility." Despite the repression, women still have some access to higher education and some have been able to take on low- level governmental posts. In recent years, under the leadership of President Hashemi Rafsanjani -- who came to power after the death of Ayatollah Khomeini in May 1989 -- moderate reforms have been made. More opportunities for education are available and more women are able to work due to special programs for part-time employment that have been put in place especially for women with younger children. There are also many reports which say the modest dress regulations for women have been relaxed. But Zaria said the situation has not improved at all, adding that women who wear brighter clothes or make-up are repeatedly harassed. Zaria herself left the republic in 1989, 10 years after the revolution. She said she participated and believed in the revolution and its promise of democracy, but was gradually disillusioned. She explained that she left because she was tired: "Tired of the whole situation; tired of walking down the street and worrying that my chador wasn't just right." Zaria said one of the main problems in Iran is the restrictive nature of the Islamic law as it is used by the regime. She said that time has evolved, and so should the state. Zaria said it is too difficult for women to protest against the new regime as they did against the Shah. She alleged the government has "tortured, imprisoned and executed" many women who have tried to rebel. She added that the only solution left is for clandestine movements in Iran and the more vocal groups outside of this state to continue in their attempts to undermine the regime. Zaria said that for the situation to improve, "The civil code and the divorce and custody laws must be changed." "The real change will occur for women when they can say, 'I can do what I want. I can dress how I want. I can read what I want and I can publish [what I write] without being censored. . . . I can work where I want. Study what I want. Leave when I want. Divorce when I want and have custody of my children." When the women of Iran supported the revolution, they did so because of the promise of more equality for everyone. Unfortunately, women have fallen prey to a new, but no less drastic, form of oppression than that of the regime they helped to destroy.